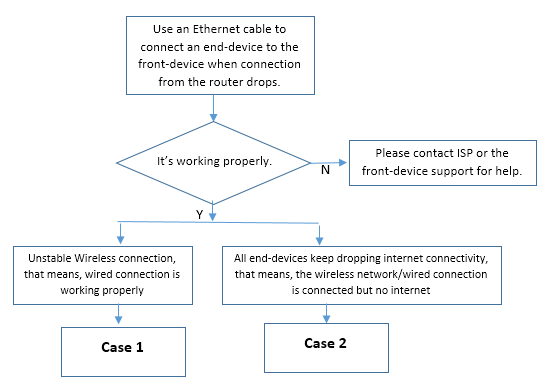 TP-Link Community > Knowledge Base > What should I do if internet connection is not stable when the device is connected to TP-Link router? You may find that your devices like your mobile phones and laptops lose internet connection constantly when they are connected to the router via Wi-Fi or Ethernet. It may be caused by many factors. Hence this FAQ will help you troubleshoot. End-device means computer, laptop, front-device(s) means your modem or main router etc. which the TP-Link router is connected to. Check whether the connection will be automatically restored after a few minutes. Check the Wi-Fi LED on the router when it happens and see if the wireless network can be found via your end-devices. It’s probably caused by wireless interference. To change wireless channel, channel width (refer to here) or get away from a wireless interference source, such as microwave oven, cordless phone, USB3.0 hard drive etc. Check firmware version of your router (here). Upgrade if it’s not the latest firmware. Contact our support if you need assistance upgrading the firmware. Contact TP-Link support with the information above for further assistance along with devices that are connected and operating system information. Note: Please only follow the steps below when there is no internet access. Log into the web management interface of the router. Log into the router in order to check the WAN IP address, Default Gateway and DNS server. Write down all the parameters or take a screenshot. And save System Log (Advanced>System Tools>System Log). Contact TP-Link support with the information required above for further assistance.